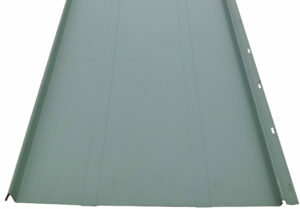 Coverage 16″ panel coverage, with a 1 1/2″ seam height. Fastening System Concealed clip and fastener system. Recommended 1 screw spaced 8” o/c. Coatings & Finishes 24 gauge pre-painted Galvalume* panels are available in a variety of colors and coated with a full-strength Kynar 500 finish. Warranty 30 year manufacturer warranty. Approvals & Testing Florida Product Approval, Class A Fire Rating (UL-790), Quality Assurance Program. Panels are also available in 26 gauge Galvalume, Aluminum and 16oz Copper.